Not to be confused with Alas Smith and Jones. Alias Smith and Jones is an American Western series that originally aired on ABC from January 1971 to January 1973. The show stars Pete Duel as Hannibal Heyes and Ben Murphy as Jedediah "Kid" Curry, outlaw cousins who are trying to reform. The governor offers them a conditional amnesty, aiming to keep the pact a secret. The "condition" is that they will still be wanted until it becomes politically advantageous for the governor to pardon them. Operating primarily in Wyoming Territory, Hannibal Heyes and Jedediah 'Kid' Curry (whose boyish face spawned the nickname) are the two most successful outlaws in the history of the West. However, the West is starting to catch up with the modern world; safes are becoming harder to crack, trains more difficult to stop, and posses more adept at tracking them down. Heyes, the brains of the "Devil's Hole Gang", falls in disfavor with fellow members. Caught between a rock and a hard place, Curry and he decide to "get outta this business!". With some public acclaim, and having "never killed anyone", they seek amnesty (not a pardon, as they were never convicted of any crime) after they are given a handbill about a program offered by the territorial governor. Through an old acquaintance, Sheriff Lom Trevors (James Drury in the pilot, alternately Mike Road and John Russell in the series), they contact the territorial governor. Unsure of voter reaction, he grants them a conditional amnesty. Should they remain lawful "until the governor figures you deserve amnesty", and be mum about the agreement, they will be granted clemency, but until that time, "they'll still be wanted". Heyes asks, "That's a good deal?" The cousins find the straight and narrow difficult. Now calling themselves Joshua Smith and Thaddeus Jones, they find themselves tangling with lawmen, bounty hunters, operatives of the Bannerman Detective Agency, and other nefarious figures. They are forced to rely on Heyes's silver tongue, Curry's fast draw, and occasionally a little help from friends on both sides of the law. Heyes was deemed "cunning", and Curry was "gunning". Heyes/Smith was considered the brains of the duo and an excellent poker player. Curry/Jones was the master gun hand and the brawn. Usually, Heyes figured out ways to make money and save the twosome from precarious situations. Starting with "The Man Who Broke the Bank at Red Gap" (season two, episode 16), a slightly revamped introduction partially explained why the renowned duo did not split to evade capture – they were cousins. Roger Davis' original theme voiceover referred to the characters as "latter-day Robin Hoods". The new introduction replaced that description with the phrase "Kansas cousins". It remained so after Ralph Story redid the introduction once Davis assumed the Heyes role. After Davis took over as Heyes, his distinctive voice could no longer be used in the theme introduction. Ralph Story was brought in to provide narration for the series (he, rather than Davis, had done so in the pilot). When the cousins were children, all four of their parents were slaughtered during the "border wars" just before the Civil War (q.v.Kansas-Missouri Border War) ("The Men That Corrupted Hadleyburg", season two, episode 17). In "The Man Who Broke the Bank at Red Gap", Heyes remarks, "My cousin and I are not Hannibal Heyes and Kid Curry." Curry also speaks of their "sage old grandfather". In the first episode with Davis, "The Biggest Game in the West" (season two, episode 19), Heyes shouts to Curry: "Yes sir! Cousin, you're all right!". In the episode "Don't Get Mad, Get Even", Curry and Heyes both make reference to their Irish grandfather Curry. Kyle Murtry (Dennis Fimple) and Wheat Carlson (Earl Holliman) are members of the Devil's Hole Gang, formerly led by Heyes and Curry. Harry Briscoe (J.D. Cannon) is a Bannerman detective who occasionally finds himself on the wrong side of the law. Patrick "Big Mac" McCreedy (Burl Ives) and Señor Nestor Armendariz (Cesar Romero) are two ranchers on opposite sides of the U.S.-Mexico border/Rio Grande waging a feud over a valuable bust which represents land that had been owned by Armendariz until the river temporarily switched course, moving the border with it, allowing MacCreedy to sell the land. Heyes and Curry get stuck in the middle. Clementine "Clem" Hale (Sally Field) is an old friend who has no problem with blackmailing the reformed outlaws when necessary. Field had appeared in only one episode before Duel's death, and she could not return due to being pregnant with her second child. Several scripts intended for her were rewritten to feature Georgette "George" Sinclair, who was played by Michele Lee. In the third season, Field did appear as Clem one last time, doing love scenes with former Flying Nun co-star Alejandro Rey. Soapy Saunders (Sam Jaffe) and Silky O'Sullivan (Walter Brennan) are retired confidence men on whom the boys call when in need of a large sum of cash and a good con to get them out of trouble. Alias Smith and Jones began with a made-for-TV movie of the previous year called The Young Country about con artists in the Old West. It was produced, written, and directed by Roy Huggins, who served as executive producer of the show. Under the pseudonym John Thomas James, Huggins at least shared the writing credit on most episodes of the series that followed. It was broadcast on 17th March 1970 in the ABC Movie of the Week strand. Roger Davis starred as Stephen Foster Moody, and Pete Duel had the secondary but significant role of Honest John Smith. Joan Hackett played a character called Clementine Hale, a character with the same name appeared in two Alias Smith and Jones episodes, played by Sally Field. This pilot was rejected, but Huggins was given a second chance and, with Glen A. Larson, developed Alias Smith and Jones. As with the previously-rejected pilot The Young Country, this series pilot proper also aired as an ABC Movie of the Week. It was made in the same spirit as many other American TV series of the time, from Huggins' own The Fugitive to Renegade, about fugitives on the run across America who get involved in the personal lives of the people they meet. The major difference was that Hannibal Heyes and Kid Curry were guilty of the crimes for which they were accused, but were trying to begin a noncriminal life. The series was modeled on the 1969 film Butch Cassidy and the Sundance Kid, starring Paul Newman and Robert Redford. (Universal contract player Ben Murphy was offered to the producers because he was considered a Paul Newman lookalike.) A number of similarities are seen between the film and the TV series: One of the lead characters in the film was called Harvey Logan (played by Ted Cassidy). In real life, Harvey Logan, also known by the nickname of Kid Curry, was an associate of the real Butch Cassidy, and unlike the TV version, was a cold-blooded killer. The TV series also featured a group of robbers called the Devil's Hole Gang, loosely based on the Hole in the Wall Gang from which Cassidy recruited most of his outlaws. 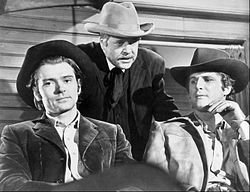 To lend them an element of audience sympathy, Heyes and Curry were presented as men who avoided bloodshed (though Curry did once kill in self-defense) and always were attempting to reform and seek redemption for their "prior ways". 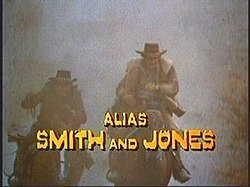 The names "Smith" and "Jones" originated from a comment in the 1969 film Butch Cassidy and the Sundance Kid, when before one of their final hold-ups, the characters are outside a bank in Bolivia and Sundance turns to Butch and says: "I'm Smith and you're Jones." Parts of the television series were filmed at Castle Valley and Professor Valley in Utah. The series continued for another 17 episodes after the recasting of Hannibal Heyes, but never regained its popularity after the loss of Duel. This, as well as the fact that the long prominent Western genre was giving way to police dramas, brought the show to an end on January 13, 1973. On January 16, 1973, Bonanza aired its final episode, leaving the 18-year-old Gunsmoke, the syndicated comedy western Dusty's Trail, and Kung Fu as the only Westerns scheduled for Fall 1973. Universal Studios Home Entertainment released the complete first season of Alias Smith and Jones in Region 2 on June 11, 2007. The title was spoofed in the 1980s British comedy series Alas Smith and Jones. In his comedy book Lolly Scramble, comedian Tony Martin makes reference to the irony of the opening narration "they never shot anyone!" with Duel only ultimately shooting himself. Even more bizarre, as Martin remarks, the person reading that line took over Duel's role. The death of Pete Duel is the subject of "A Hole in Water", a song by indie band The Temple Cloud Country Club, on their 2009 album 'When We Were Invented'. ^ a b c Snauffer, Douglas; Thurm, Joel (2008). The Show Must Go on: How the Deaths of Lead Actors Have Affected Television Series. McFarland. ISBN 0-7864-3295-0. ^ Yoggy, Gary A. (1995). Riding the Video Range: The Rise and Fall of the Western on Television. McFarland & Co. pp. 477–478. ^ The Young Country on IMDb . ^ Glen A. Larson, audio commentary on Alias Smith and Jones, Season One, Disc One, the pilot, Universal DVD, 2007. ^ Lacey, Gord (2006-12-12). "Alias Smith and Jones - Heyes and Curry become Smith and Jones this Feb!". tvshowsondvd.com. Archived from the original on 12 March 2010. Retrieved 19 November 2010. ^ Lambert, David (2010-03-11). "Alias Smith and Jones - TMG's Seasons 2 and 3 Release Gets Closer Date, Lower Price and Package Art". tvshowsondvd.com. Archived from the original on 16 June 2010. Retrieved 16 June 2010. ^ Lambert, David (2010-08-30). "Alias Smith and Jones - All 3 Seasons Come Together for The Complete Series 10-DVD Set". tvshowsondvd.com. Archived from the original on 3 September 2010. Retrieved 19 November 2010. ^ "Alias Smith And Jones - Series 1 - Complete [DVD] ". amazon.co.uk. Retrieved 19 November 2010. This page was last edited on 8 February 2019, at 05:20 (UTC).